The English violin concerto repertoire is indeed rich and varied, but despite many outstanding pieces, the Britten and Walton works coming readily to mind, only Elgar's monumental masterpiece has made it to the very top. This highly interesting disc explores some of the most off the beaten track pieces in the genre, and in all honesty, all three composers are quite a novelty to me. Racine Fricker and Banks were contemporaries, while Morgan was some ten years younger. Fricker wrote his Op. 11 in 1950 while Morgan's and Bank's works are only to years apart, from 1966 and 1968 respectively. The Racine Fricker creation is written for a small orchestra where the solo part is allowed to shine without resorting to rhetoric. The dominant tone is one of restrained discourse, avoiding overblown gestures. David Morgan's concerto is the result of the composer's bitter experiences in Prague during the late 1960's, and the work is permeated by the description of how the individual is slowly crushed by forces he can neither resist nor control. The violin represents the struggle whilst the orchestra represents a destiny that no one wants but eventually must share. 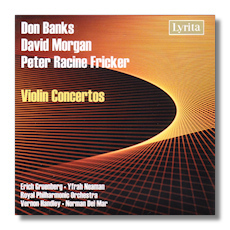 Don Banks wrote his Violin Concerto in 1968, which was premièred in the same year at the Proms. The work reflects the composer's predilection for serialism and his handling of the style is highly original. The piece includes a vast array of forces including some intriguing percussion. As expected these pioneering recordings by Neaman and Gruenberg reveal both soloists at the top of their technical capabilities and they receive sympathetic support from the equally fine accompaniment of Handley and Del Mar. This is a fine issue, worth exploring for all lovers of rare violin concertos.